Ordinary domestic life wastes finite resources, worsens climate change and pollution and can make enjoying life that bit harder. The desire to do what ended up happening in Brisbane in 2003 originated in England during the “Oil Shocks” of the 1970’s. For most Australians the British experience of an oil-dependent economy without enough oil is quite literally unthinkable. If you are part of the majority of Australians who have no idea about the Arab-Israeli War of October 1973 (aka The October War) and its consequences, check out this link. World oil production peaked around 2006 – 07, demand for fossil fuels keeps growing and prices are not going anywhere but up. All food producing gardens require inputs of phosphorous, it’s one of the three major nutrients required by crops however they are grown and a phosphorous is an essential element for a healthy human diet. Phosphorous is mined, Australia imports around 60% of its phosphorous needs and global production this finite resource will peak mid-century. Food security, sustainable population, sustainable energy and resource use, affordable housing, pollution control and global warming will not go away. Australia will become a conserver society soon enough. How will we make the change? In an ordered way by choice, or chaotically when there is no choice left? ‘Bellis’ has been adapted to reduce a household’s impact on the natural world: saving domestic water use, reducing sewage and stormwater pollution, reducing peak demand for energy and reducing greenhouse gas production. The back garden grows fruit, vegetables, herbs and spices. 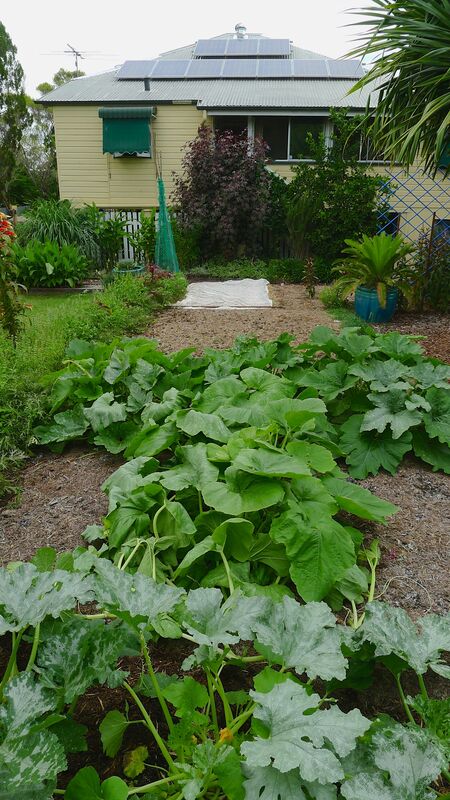 The decorative front garden grows plants suited to natural rainfall and long-lived stock has been selected to cope with predicted climate change for Brisbane to 2050. Both are grown sustainably. In 2003, the retrofit aimed to spend less than a new family four wheel drive car on the sustainability items. The only subsidy has been a rebate from the federal government for installing solar panels. Michael Mobbs of Sustainable Projects is familiar with domestic sewage systems and he liaised with Brisbane City Council, smoothing the development application. Approval was quickly granted. A 21,000 litre, in-ground concrete rainwater tank was installed. When full, this theoretically provides a three month supply of water for the house, not the garden. Excavating the tank pit generated 37 cubic metres of soil. Aware of the problems of rapidly filling landfill sites this was spread and conditioned on site. Leaf and mosquito excluding rain heads have been fitted, one atop each downpipe to prevent any leaf litter entering the tank. Each downpipe is fitted with a first flush device. The rainwater tank is gravity filled. The tank is connected to mains water. A float valve prevents the water level falling below the output pipe. The capacity to collect rainwater is hardly affected but there is no need to worry about running out of water. A network of soakaway trenches around the property capture any rainwater tank overflow during very wet weather and any surplus is discharged into the stormwater infiltration well in the front garden. A sediment and activated carbon filter on the mains supply to the tank remove chemical (chlorine, but not fluorine) and biological pollutants. A ceramic and carbon filter are fitted to the drinking water fountain in the kitchen. All waste water feeds this system which digests solid waste. Water passes through a sand and gravel filter, enters a holding tank and then passes through an ultraviolet filter for chemical free disinfection and is ready to flush the toilet and water the garden. Once the garden layout is complete, excess water will be used to hand water the food garden. Independent wastewater quality testing documented that no contaminants, including chloramines, remain in the wastewater. The original photovoltaic system (2003-13) comprised six solar panels on the north facing side of the roof. Compared to the new panels, the original ones were very heavy and less efficient. In 2014 a new system (pictured) comprising of two arrays of ten panels were installed. One array faces east, the other west. The old system supplied, during summer, up to 60% of household daily needs with the balance being purchased as certified renewable energy. Solar systems supply 220 to 240 volt, 50 Hertz power, the Australian Standard, and plug into the power grid. During the day surplus power is directed into the grid, power is drawn from the grid as needed. At night the house effectively uses the grid as a battery, drawing back some of the surplus power generated during daylight. The new system produces three times as much energy as the house needs. Even on a cloudy winter day the house is more than self-sufficient in electricity. A contract with the energy supplier pays the household for the excess power Bellis supplies to the grid, a perk from being an early adopter. This evergreen contract only ceases if the household changes energy supplier or the house is sold. Peak power output corresponds with the most intense period of sunshine, which coincides with Brisbane’s peak energy demand, the time when everone’s air-conditioning is working hardest. The retrofitting budget included buying equipment. The old electric cooker was replaced with gas. The old electric water heater was replaced with an efficient instantaneous gas water heater – there wasn’t enough room on the roof for a solar hot water system plus photovoltaic panels. The old washing machine died a week after moving here and had to be replaced with a water and energy efficient front loader. The ‘energy star’ and water efficiency ‘A’ ratings are helpful in making the most approriate choice, but the water ratings are not absolute. They compare like with like. For example a four ‘A’ top loader is not nearly as good a water saver as a four ‘A’ front-loader. Compact fluorescent light globes are long lasting: they were brought here from Sydney. Originally the plan was to have the rainwater tank under or alongside the house, but Brisbane City Council would not permit installation within ten metres of the sewage system – a hang over from the bad old days of leaky septics. So the tank is at the top of the garden. The resultant plumbing work cost twice as much as the cost of the tank, and more electricity is used for a pump to draw water to the house. The energy supplier took three months to connect the solar panels to the grid (back in 2003 solar households were a novelty) so Bellis was unable to generate electricity during the first summer after installation. I learned that it’s critical to use quality gravel suited to a wastewater filtration tank. The installer used cheap gravel that contained iron. This dissolved out, turning the water brown. A rusty deposit stained the toilet bowl and impeded efficient decontamination by the UV filter. The gravel was replaced, the sewage system carefully cleaned and put back into action. 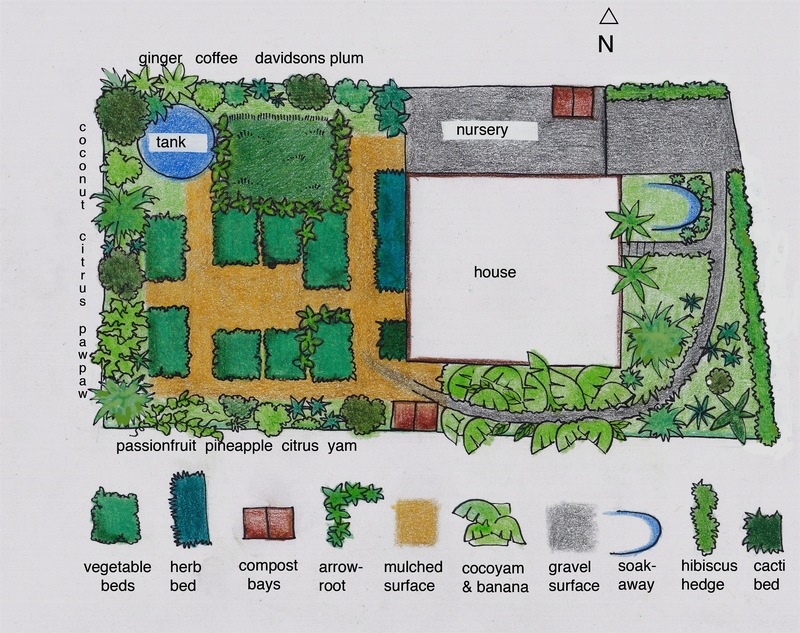 Nick Walford-Smith, an award-winning Gold Coast-based landscape designer created a beautiful landscape plan to work from. The layout slightly changed as a result of inadequate funds to complete certain landscape features, like the summer house planned to sit above the rainwater tank. Instead of a solar pergola, a Screw Pine (Pandanus tectorius) was planted in the centre of the vegetable garden to shade outdoor meetings. The nursery area was found to have sufficient shade from neighbouring trees in summer to function as a propagation area without a constructed shadehouse. Green Survival, Brisbane-based landscape contractors, installed the land drainage from the tank around the property, the stormwater infiltration well and the gravel-lined front garden path and driveway. Soil conditioning was based on thorough laboratory testing and specialist advice from the National Measurement Institute, Sydney Environmental Soil & Laboratory and the President of the Australian Society of Soil Science, Queensland, (now Soil Science Australia). A test crop of silverbeet was grown and laboratory tested for the presence of toxic metals (lead, mercury, cadmium, copper) and other persistent organic pollutants (POPS) that might prevent bioaccumulating crops, like turnip, radish, beetroot and silverbeet, from being eaten. Tests results proved the soil is safe for cropping.